A beautiful house is like a work of art; it requires an artistic vision, an organized aesthetic, and a precise execution. The Brazilian creatives at Studio MK27 have finished work on the L House, an abode that is not only a work of art but a possible real world construction of a Mondrian painting. The L House is named for the structural shapes present in the building, a cubist construction that seems so precisely calculated that you can practically see the equations. Everything from the shimmering, placid pool that extends the length of the backyard to the cavernous entryways are all perfect rectangles, making the house as much a geometry lesson as an abode. The interior of the house is something of a labyrinth, with one compartmentalized room leading into another through a complex network of vaulted ceilings and elongated hallways. 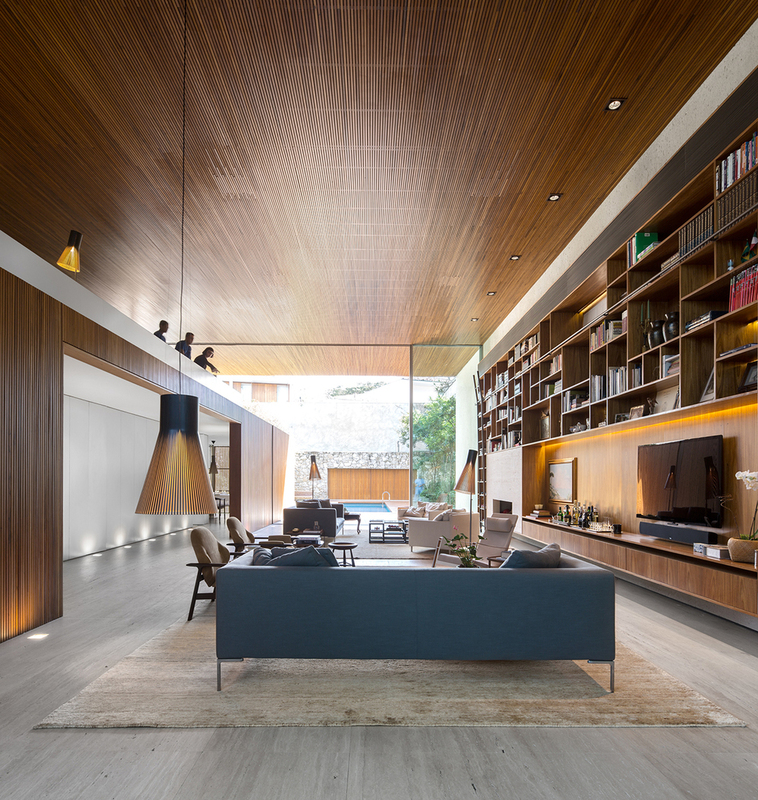 Natural light floods every room of the house through small versions of the perfect rectangles. The house holds a very organic, earthy aesthetic, with a lush roof garden and meticulously manicured lawn in the backyard, and an abundance of natural stones used in the construction of the house. Smooth granite slabs make up many of the stairs and surface tops of the house, as well as intricately laden stone floors on the outside patio. The L House is one of many other homes created by Studio MK27, yet it carries such a unique, site specific design that it could pass for the magnum opus project of a lesser studio. 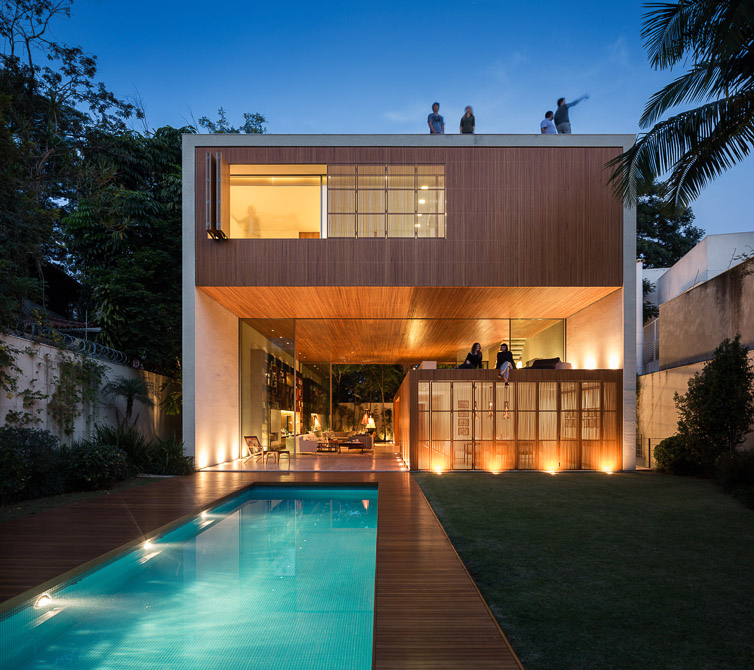 Led by beloved architect Marcio Kogan, the design house has received numerous awards for their architectural wonderments. Their philosophy is all about the details, a tenet that shines through in the L House, a structure where the minute details are what draws together the entire aesthetic. The L House seems an oasis within the lush, Brazilian jungle that surrounds it, yet it is an oasis that has been given the utmost attention by contemporary designers, leaving a home that is an interesting mixture of elements both organic and artificial, with interior styles of bare bones minimalism and elegant antique fixtures. There is a little something for everyone stashed away in this house.